The MacBook stand supports your ergonomics by raising the display and angle the keyboard. The stand will also keep your laptop cooler and protect it in you bag – brilliant right? It is our favourite design because you can take it and use it everywhere. Made in Denmark using traditional Danish craftsmanship from sustainably forested woodland. 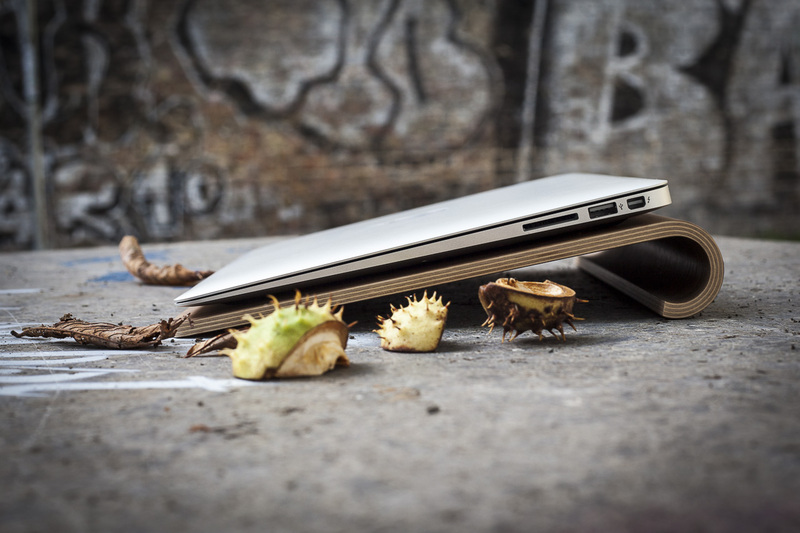 The environmentally friendly design will support your ergonomics and protect your MacBook with a natural feel. Can you ask for more? No extra bulk! It’s easy to carry your MacBook if you are in a hurry to do a few hours of work in your favourite cafe. It gives you a good grip and extra protection if you bump into something along the way. We want to add a soft touch of nature to the machined aluminium. We make all our products in wood because it is sustainable and it will improve your comfort. The stand will also improve the air flow and keep you MacBook longer on on demanding tasks. The stand is designed to fit your MacBook and come in sizes for the 13-inch and 15-inch models.